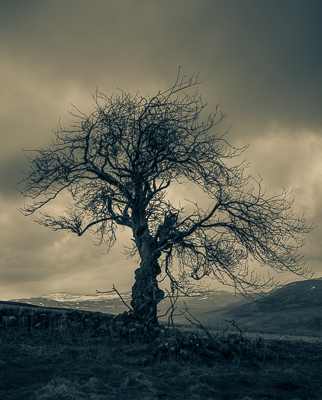 Photographed at Lycondlitch to the North East of Blair Atholl, now in ruin the shepherds cottage and out buildings also has this amazing lone gnarled Wild Cherry tree. This interpretation is close to how I envisage it, frankly its just so easy to make something moody when the weather is dull. I could see it being the cover of some mystery paperback, possible with the addition of a lone crow in the sky.